March 16 was historic. It was important. Crimean authorities showed how real democracy works. They shamed America’s sham process. Monied interests control things. People have no say. Both major parties control a rigged process. They’re two sides of the same coin. Not a dime’s worth of difference separates them. Independent candidates are virtually shut out. Americans get the best democracy money can buy. Crimeans got the real thing. International observers praised the process. Voting went peacefully and smoothly. It was scrupulously open, free, and fair. No irregularities occurred. None were seen. No pressure. No intimidation. Not a single Russian soldier in sight. None invaded. None occupy Crimea. Claims otherwise are false. They’re Western propaganda. They’re malicious lies. Turnout was impressive. It was unprecedented. It exceeded 83%. In Sevastopol, it was 89.5%. Over 1.274 million Crimeans voted. Plus Sevastopol residents excluded from this total. An astonishing 96.77% chose Russia – 95.6% of Sevastopol voters. A previous article said Russians comprise about 60% of Crimea’s population. Ukrainians around 25%. Tatars 12%. “After that, our commission compiled the final protocol.” Commission members signed the official document. It certified election results. A scant .72% of ballots were declared invalid. “No one can take away our victory. We are going to Russia.” He spoke accompanied by the Russian national anthem. Crimeans celebrated their landslide victory. Ludmila Balatskays is a 72-year-old former Sevastapol city government deputy. She spoke with tears in her eyes. Most other Crimeans share her joy. He urged steps taken to change things. Regional stability depends on responsible policies. An official White House statement said Obama called the referendum illegal. He accused Russia of “military intervention.” He lied saying so. Moscow didn’t intervene. Claims otherwise are false. Obama said “the United States and the international community…would never” recognize referendum results. “(W)e are prepared to impose additional costs on Russia for its actions,” he added. Russian State Duma Speaker Sergey Naryshkin highlighted Western hypocrisy. On the one hand, its officals reject Crimean self-determination rights. On the other, they call Kiev putschists legitimate. They ignored their brazen coup d’etat. 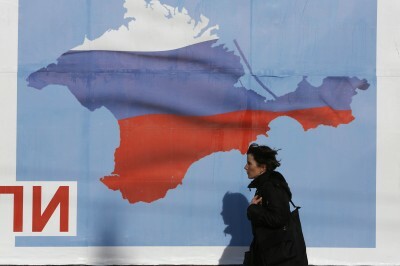 On March 17, Crimea asked UN authorities and international community countries to recognize their self-determination. A resolution was adopted doing so. “The Republic of Crimea seeks equality, peace, and good-neighborliness as well as political, economic and cultural cooperation,” with all other nations, it said. On Monday, Russian State Duma Vice Speaker Sergei Neverov said parliamentarians will complete all necessary legislative procedures on accommodating Crimeans at the earliest possible time. “The results of the Crimean referendum have clearly indicated that the residents of Crimea see their future only as part of Russia,” he said. On March 21, Federation Council and State Duma members will vote up or down on letting Crimea join the Russian Federation. Sentiment in both houses suggests overwhelming approval. Days earlier, Federation Council chairwoman Valentina Matviyenko said so. Russian State Duma Speaker Sergey Naryshkin echoed her sentiment. Russia has been losing people for years, he said. “(A)t last, we’re getting our compatriots back. So that’s a historic moment for Russia.” Putin has final say. Crimean Parliament Speaker Konstantinov said Crimea can join Russia in weeks. Perhaps by end of March, he added. Crimea will draft a new constitution. “We will send it for approval to the Russian parliament,” he explained. Steps are underway to shift from Ukraine’s hryvnia to Russia’s ruble. Next week, the ruble will be introduced as a second official currency. Dual currencies will continue for about six months. Thereafter, Ukraine’s hryvnia will be discontinued. According to Crimea’s Prime Minister Aksyonov, integrating Crimea fully into Russia may take up to a year. Perhaps sooner, he added. At the same time, Crimea wants good relations with all nations, he stressed. On Monday, EU foreign ministers met in Brussels. A second unnamed source said Brussels “might reopen discussion” in further talks. “At this late stage, I think they will focus instead on sending out a unified EU message,” the source added. Reuters said an initial list of up to 130 senior Russian officials would be reduced to perhaps “tens or scores” for final consideration. Washington readied its own list. White House senior adviser Dan Pfeiffer said “(y)ou can expect sanctions designations in the coming days.” Perhaps sooner. Similar asset freezes and travel bans on Russian officials were announced. Putin was excluded. Washington imposed sanctions on 11 Russian and former Viktor Yanukovych government officials. Moscow’s Deputy Prime Minister Dmitry Rogozin was named. A White House statement said sanctions target officials who “undermine democratic processes and institutions in Ukraine.” None exist except in Crimea. It applies to foreign nationals and Americans. Property belonging to Russian nationals can be seized. For sure it’s a threat of a good example. It runs counter to Washington’s imperial ambitions. Wiggle room language permits circumventing fundamental rule of law principles. So-called “direct or indirect…actions or policies that threaten the peace, security, stability, sovereignty, or territorial integrity of Ukraine” aren’t defined. Nor is how Crimean self-determination threatens US national security. The claim is absurd on its face. It’s outrageous. It’s offensive. It turns logic on its head. It reveals lawless US governance. Obama can act any way he wishes. He can do so by diktat. He can act lawlessly. He can enforce Washington rules. He’s playing with fire. British MP George Galloway is right saying Western leaders created a Frankenstein monster in Ukraine. It’s “a very serious threat,” he said. The damn fools in Washington and Brussels perhaps didn’t “read the novel Frankenstein to the end,” said Galloway. “And this monstrous” Kiev neo-Nazi threat poses potential grave problems for Europe. Perhaps for humanity if war erupts. Stephen Lendman lives in Chicago. He can be reached at lendmansteph[email protected] His new book as editor and contributor is titled "Flashpoint in Ukraine: US Drive for Hegemony Risks WW III." http://www.claritypress.com/LendmanIII.html Visit his blog site at sjlendman.blogspot.com. Listen to cutting-edge discussions with distinguished guests on the Progressive Radio News Hour on the Progressive Radio Network. It airs three times weekly: live on Sundays at 1PM Central time plus two prerecorded archived programs.